This one year old Sweet Lavender was planted last spring from a three inch pot and it is on its way to becoming a giant. One of the largest lavenders we grow; it will top out at close to four feet with its blooms which can be up to two feet long. Sweet Lavender is from France and Italy. As you can tell by looking at the lavender in the background to the right, Sweet Lavender has a much greener leaf than most other lavenders. Sweet Lavender has proven tough and reliable even when the temperatures dipped briefly to 5 degrees. It is also really drought resistant. If you are in a humid zone 8 climate, you might try Sweet Lavender. It has proven to be a bit more tolerant of heat and humidity than the other Zone 5 lavenders. This can be said of all the zone 8 lavenders which includes French Lavender, Spanish Lavender and Yellow Lavender. 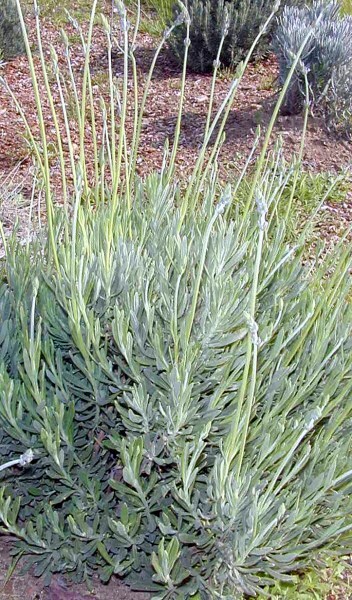 Fast growing, Sweet Lavender is not suitable for cooking because of its high menthol content. It does however have a nice smell and a good form if pruned every year. It can be used in potpourri and its long wands make it a good candidate for arrangements. Because Sweet Lavender grows rapidly and densely, it can be a good choice for a two foot tall hedge. Plant every three feet to allow for lots of flowers every year. When lavenders are planted to close together their sides grow together and some flower production is lost. Prune tightly for a formal look and into soft mounds for a less formal, more cottage garden feel. Sweet Lavender makes a great addition to our Zone 8-11 Fragrant Herb Garden Six Pack. This plant is often available in plug trays. These trays hold 128 of all the same plant. They are a great low cost way to fill a lot of space. Each cell is 3/4 of inch by an inch. Check here to see if Sweet Lavender Plug Trays are available.